How to Watch 3D ISO on Samsung 3D TV with Side-by-Side 3D Effect? "Hey everyone. I've got almost 500+gb files of 3d movies but they are all .iso,I've searched all over the internet to find a solution but all resulted in an epic fail.I tried some converters but they never make the iso file 3d. It just makes them to the normal version. If anyone has done this before kindly help, It'll be appreciated :). Regards, Khalid Latif." The 3D formats used by most direct TV like 3D Samsung 3D TV are usually Side-by-Side 3D format, which is not full resolution 3D formats. To display Side-by-Side 3D, your Samsung 3D TV will have to split the frame into its left and right sub-frames; these sub-frames are then up-scaled to the set native screen resolution and displayed in a Frame Sequential manner. Although Samsung 3D TV enables you to play 3D movies with SBS format, however, it does not mean that you Samsung 3D TV can playback file format with 3D SBS TV format. 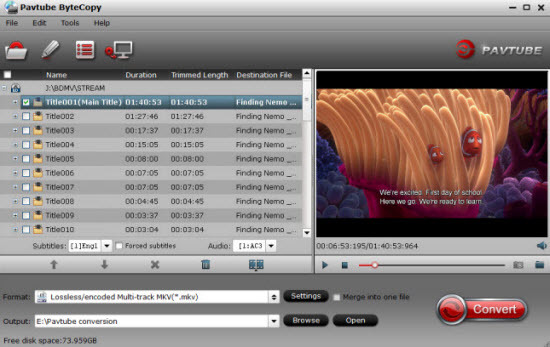 It does only support 3D formats in just few limited file formats such as MP4, MKV, MOV, AVI, WMV. Therefore, there is no doubt that you will fail to open 3D ISO files on your Samsung 3D TV. To achieve best 3D effect when playing 3D ISO on Samsung 3D TV, the best solution is output 3D ISO to Samsung 3D TV playable 3D SBS MP4 format, which is widely compatible with virtually any Samsung 3D TV models. To get SBS 3D MP4, we would like to recommend you to download the best 3D Blu-ray Ripper application - Pavtube ByteCopy for Windows/Mac, which is better reviewed than all the other 3D Blu-ray ripper application on the market. It has full support for both 3D Blu-ray disc and also 3D ISO images, you can easily transcode your 3D ISO to Samsung 3D TV compatible Side-by-Side MP4 format with just few clicks. 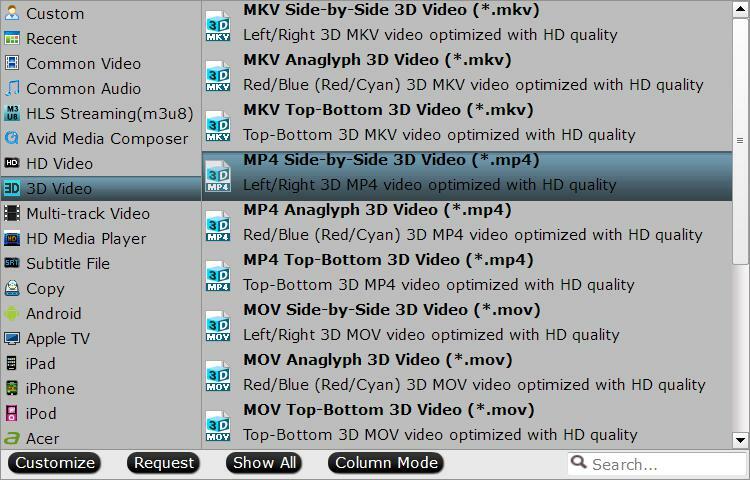 Besides SBS 3D formats, the program also gives the chance to output other 3D formats such as Anaglyph 3D (anaglyph 3d vs sbs 3d) or Top and Bottom 3D for playback on PS3 or PS4. To enhance your 3D viewing experience, you can adjust the output 3D profile settings such as change the 3D depth or enable "Switch Left and Right" to decide which direction images to display first. How to Output 3D ISO to Samsung 3D TV SBS MP4 Format? Click "File"drop-down list and select "Load from disc"to import your 3D Blu-ray movies to the program. Step 2: Define Samsung 3D TV supported 3D format. Click "Format"bar, from its drop-down list, choose to select "MP4 Side-by-Side 3D Video(*.mp4)" as the desired output format for playback on Samsung 3D TV, you can also choose to output other 3D SBS formats according to your own needs. Step 3: Customize output 3D profile settings. 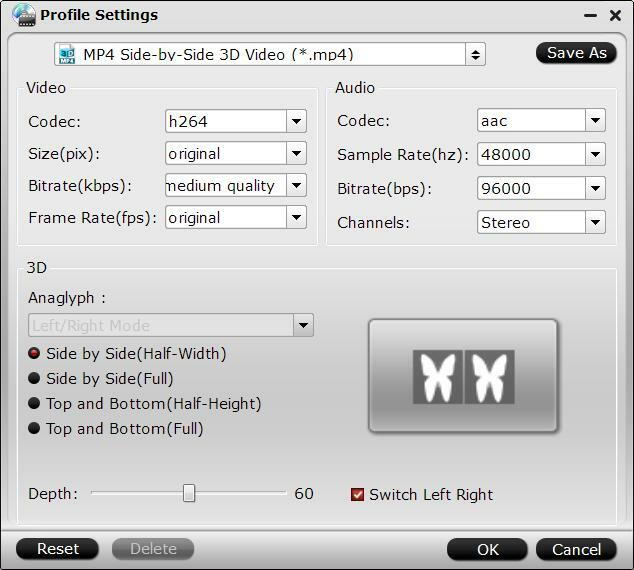 In the "Profile Settings"window, you can not only adjust the output 3D video and audio profile settings, but also change the 3D Depth by dragging the slider or check the "Switch Left and Right"to decide which direction images to display first. Step 4: Start 3D ISO to 3D SBS MP4 conversion. 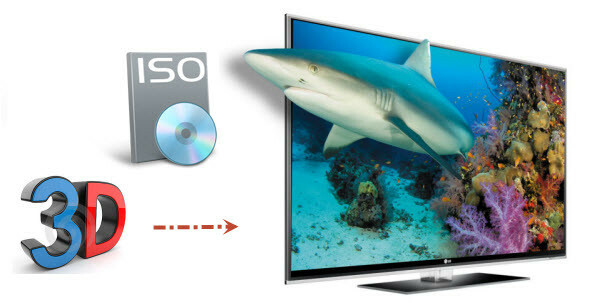 When all the setting is done, begin the conversion process by clicking the right-bottom "Convert"button to begin 3D ISO to Samsung 3D TV SBS MP4 conversion process. When the conversion is done, you can watch your favorite 3D high definition movies on your 3D TV by wearing a 3D glasses. Besides watching 3D movies on your 3D TV, you can also choose to watch 3D movies on computer or using a home 3D projector to watch 3d movies with wide-screen visual enjoyment.